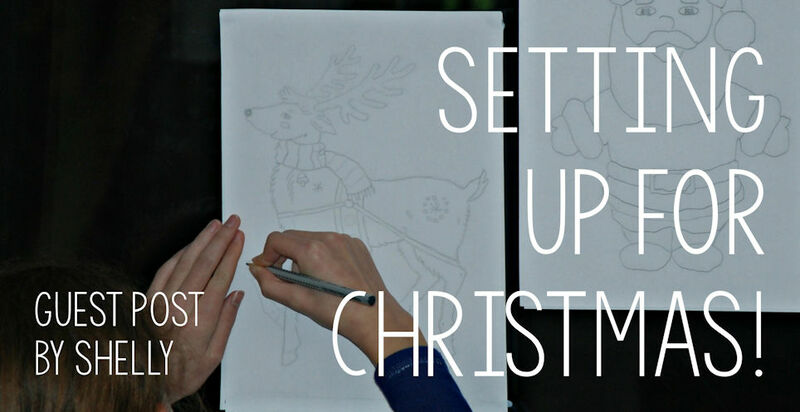 Guest Post - Setting Up For Christmas! My kids are already getting very excited about Christmas so I have been printing out a few goodies and getting some items set up for them. My youngest is big into tracing over pictures at the moment – he stands by our sliding doors for ages and just traces picture after picture. So I printed out two Christmas themed pages for him to start with – we went for a Santa Claus and a reindeer. I have actually noticed that after he traces a picture a few times, he then tries to draw them so I am trying to encourage the tracing while he is keen. And I am thrilled that he is getting his older sister to join in as well. We also started a countdown page (yes I know it is not yet December but ever since we posted Christmas cards to relatives overseas both of mine have been trying to keep a countdown). We went for this countdown poster and slotted it into one of our write and wipe pockets so we can just rub out the number and rewrite it every day. We also decided to continue with a colouring Advent activity this year so we went for the colouring calendar pages. I thought the pictures were lovely and not too complicated so the kids will easily be able to finish one a day. And they are also really great to use in some Christmassy Maths (I wrote this guest post last year about a few ways you could you the Christmas stocking pages in Maths activities). Sticking with the whole advent countdown theme my kids also asked for the advent paper chain pages. But they want to use them for a reverse Advent activity – the idea that each day of December they add a new paper chain – so instead of counting down the days with the paper chain they want to count the dates of December i.e. starting with 1 for the 1st of December). The home educator in me also could not resist printing out a few “learning type” pages. I love the Advent Word Search, Advent Crossword and Advent Word Scramble pages – I find with my youngest it is best to start with the word search, then move onto the word scramble and finally the crossword – that way he goes from searching for the words, to looking at existing letters to figure out what they spell to finally having to spell the words by himself. Oh and also the Advent Cloze page. And my last set of printing (for the moment) was a few of the Christmas complete the page pictures. And a few have even been attempted already!